Brent Bolen gathers heifers to get ready for artificial insemination. This is a picture of some of our heifers that we have recently processed to get ready for artificial insemination. We have never used artificial insemination on our farm before and are very excited to use this technology. We think it will be a great opportunity to use proven sires for low birth weights and maternal traits for future replacements cows. Also, we have been busy with our poultry that will be going to market in a week or so. When they start getting bigger, the demand for keeping everything perfect in the houses starts to increase as well. We are also getting the cleanout equipment serviced in case we decide on a complete cleanout after this flock. I am also getting hay equipment serviced and maintained because it looks as though we could start on the alfalfa in the next couple of weeks if the weather permits. On the personal side, softball, choir, art, FFA activities and schools functions are happening almost on a daily basis. I even made a trip to Iowa to buy some bulls and did a little sheep shopping while I was there. Our ewes are finished having babies and the early born will get weaned this week. Even though we raise our own we still like to buy a few really good ewes to show and then put back in our flock to breed. Probably like a lot of folks, our feed grinder got brought out of retirement this past year. We had gotten lazy with somewhat cheap feed and just bought it already ground and mixed. With the high price of corn and all the added cost at the feed store, we went back to making our own ewe and lamb creep feed. We mainly dry-lot our ewes because if we allow them to graze it seems we struggle too much with internal parasites (worms). Grinding sheep feed on the Bolen farm. We also received a new flock of baby chickens in the four houses close to our home place. We have the other four houses set a week apart, so we have the work spread over a little more time. We are still in full-blown calving season. We have close to 60 on the ground now. In fact, I’m sitting in my pickup writing this on my iPhone waiting on and watching a first-calf heifer. We have been blessed with rain and mild weather compared to the rest of the state. One thing that keeps concerning me is how quickly it dries out after these rains. We are normally knee-deep in mud this time of year. We will see what this next spring and summer has in store. None of our ponds are completely full. They are, however, in way better shape now than they were last fall. Next week is our county livestock show, so I hope we are reporting success from the competition. My dad, a neighbor, and I baled 125 bales of hay for us on our 1st cutting of prairie hay and 2nd of bermudagrass hay. I mowed the meadows with the help of dad on our neighbor’s tractor. We also worked on the combine changing the concaves from our small wires for wheat to round bars for corn and soybeans. Also we did some minor repairs like taking a half link out of the feeder house chain and sealing come cracks. We have been working on getting the planter ready for corn planting next year. Also, we have put new blades on it so that we can get a clean cut through the ground. Recently we worked the rest of our fall cows and weaned the calves. We sold the steers and kept the heifers to grow out and decide which ones to keep for replacements. Then we ground feed to put in the creep feeder to grow the heifers out. Dad has been at meetings, he was appointed to chairman of the county excise board, which sets the county budget. Katy left for FFA Alumni Camp Sunday and gets back Wednesday. Greg and Kody grind feed for the heifers. Raking hay into windrows for baling. The Leonards check calves in a chute. 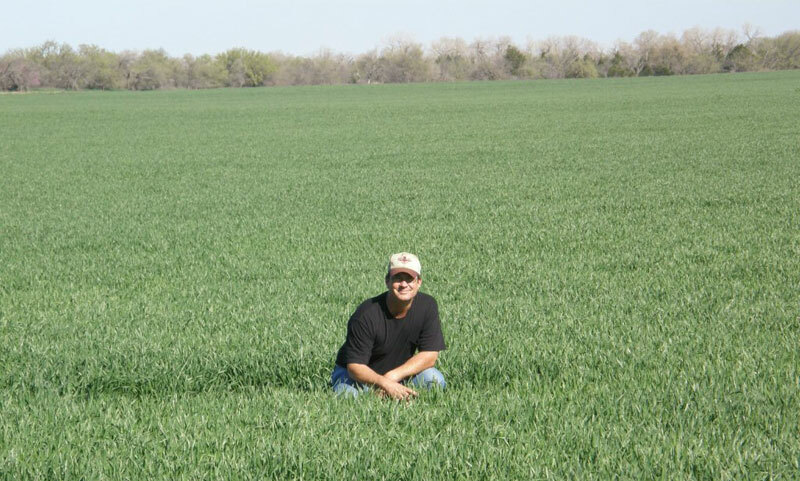 Brandon checking a winter wheat field. I failed to introduce our family last week. I’m Brandon Webb. My wife is Cari and we have two sons, Clayton, 19, and Wade, 16. 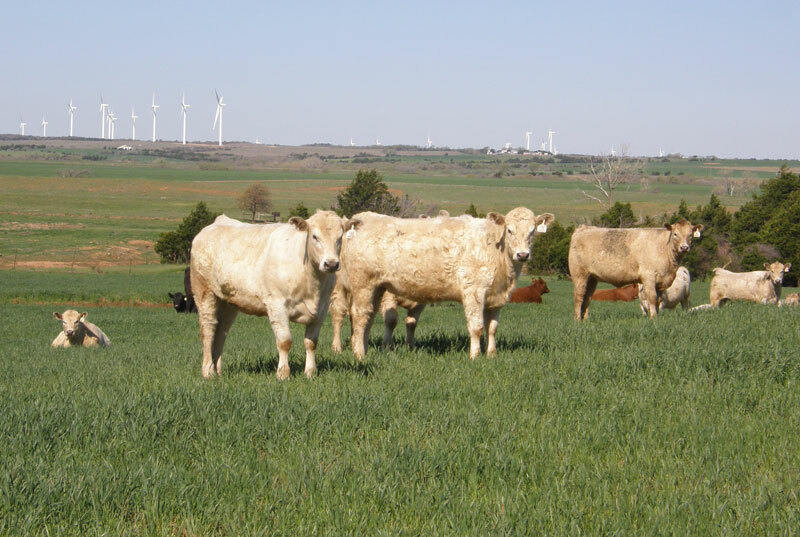 We live about 9 miles southeast of Canton, OK where we farm and raise cattle. I work full time here on the farm. Cari works part-time at Wheeler Brothers Grain Company in Watonga and on the farm keeping books and performs any other tasks where her help is needed. Clayton graduated from Canton High School last spring and is currently working on the farm while also pursuing a helicopter pilot’s license. He has 3 days of helicopter school this week. Wade is a sophomore at Canton High School. 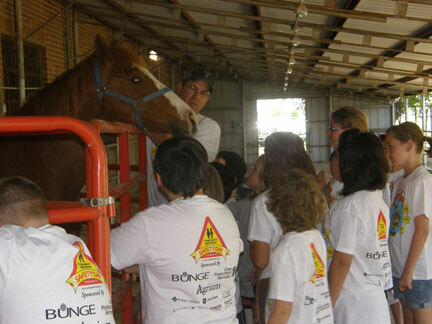 He works on the farm as well and is also very active in school activities. He has 4 baseball games this week. He pitches and plays first base. 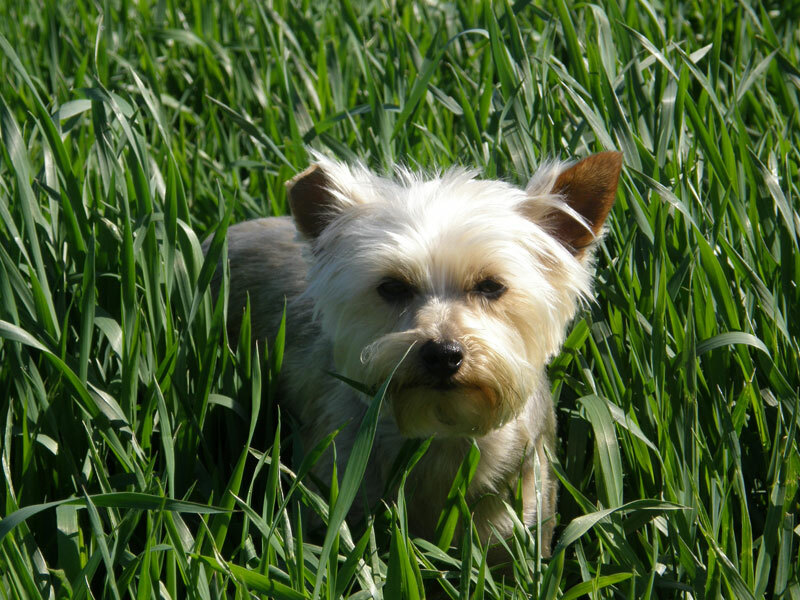 Holly Berry playing in the wheat. little milo and hay-grazer each year. Our grass pastures are predominately native but we also have quite a few acres of Bermuda. We do quite a bit of seasonal custom work throughout the year. We put up hay, wick rye, sow wheat, clip cedars and do various other custom jobs where we can utilize our equipment to create additional income. This week we will start applying fertilizer and weed killer on our Bermuda grass pastures. We’ve been checking wheat fields this past week and it looks like it may be about 2 weeks ahead of schedule right now which might mean hay season will start a little early too. We’ll go ahead and start running our hay equipment through the shop this week getting it ready to go. Fall-calving replacement heifers on wheat pasture. as yearling feeder cattle but sometimes sell them as stockers if we need to. Our cow herd is comprised of 500 Angus and 200 Charolais cross cows. We use registered Angus and registered Horned Hereford bulls on our cows to produce crossbred calves. Our spring heifers are still calving. We are down to 16 head now. We also have a set of fall calving replacement heifers that will start calving in October. We were blessed with 2 inches of rain last week. So far spring has started out quite nice.